The Slik Lite CF-522 Carbon Fiber Tripod was on sale last week for $150 at Adorama. The bad news is that the price has now increased to $200. The good news is that this tripod has a $100 mail-in rebate on it, making it $100 after the $100 mail-in rebate. 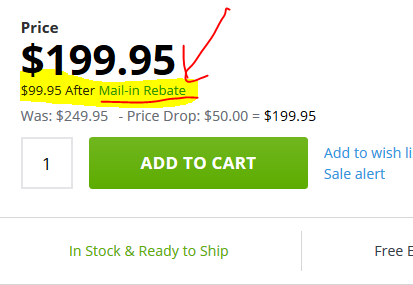 The PDF link of the rebate form can be found at the product page. Per the PDF file, it runs for the whole month of November 2017, and it is maximum two per household for this promotional period. The $100 will be a prepaid VISA or Mastercard gift card. This is a five leg carbon fiber tripod. Per the PDF, the rebate only works for this specific model, and this rebate form is specific to Adorama, not other retailers. A sliky smooth tripod sale at Adorama now, they are offering the new condition Slik Lite CF-522 Carbon Fiber Tripod with Removable LED Flashlight for $150 with free shipping as a limited time sale. For more action, check the latest Adorama Tripods and Lenses sale, which, as the name suggests, focuses on tripods and lenses. Doorbusterama returns with a new limited time offer running until 9/20/17 (or earlier if sold out). You can get the new condition Slik Lite CF-522 Carbon Fiber Tripod with Removable LED Flashlight for $170 with free shipping from Adorama. In addition to the previously mentioned Monopod special, Adorama also has a tripod flash sale, the new condition Slik PRO 500 BHX Tripod with PBH-525DS Ball Head (8.8lbs Capacity, 65″ Maximum Height) is on sale for a limited time for $90 with free shipping. In other Adorama action, check their April Sales and their NAB 2017 specials. Speaking of which, for two days only, the this Dell XPS 27″ AiO computer (4K Ultra HD Touchscreen All-in-One Computer, Core i7-6700 3.4GHz, 16GB RAM, 2TB HDD, AMD R9 M485X 4GB GDDR5, Windows 10 Home) is on sale for $2000 with free shipping.